By Dale Johnson Posted: March 16, 2017 11:00 a.m.
A team of researchers from the University of Regina and the University of Saskatchewan will look into issues related to establishing small nuclear reactors. The $1.1 million multidisciplinary project – led by Dr. Esam Hussein, dean of engineering and applied science at the U of R – is being funded by the Sylvia Fedoruk Canadian Centre for Nuclear Innovation. “This project will provide us with a better understanding of issues related to nuclear technology and will help train Saskatchewan experts to know how to deal with those issues, both here in Canada and around the world,” explains Kevin Schneider, the Fedoruk Centre’s interim executive director. 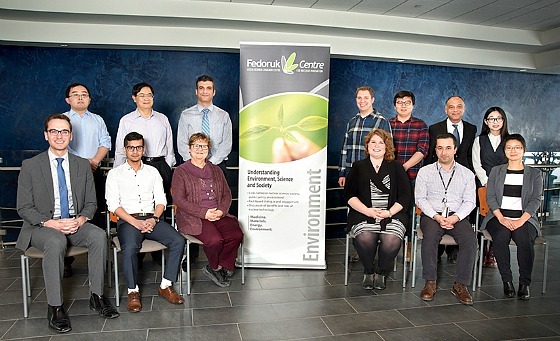 The project team includes 14 researchers from five faculties and departments at the U of R and the U of S. This will help Saskatchewan graduate students develop expertise in the engineering, geological, geographical, regulatory and economic factors of building a small modular nuclear reactor in a place that has not previously used nuclear power, using Saskatchewan as its case study. "Small modular nuclear reactors will inevitably play a role in the clean-energy mix, and it is important to explore and understand their technical licensing processes,” says Hussein. “This project will build the capacity of Saskatchewan researchers and students to address technical, engineering, and regulatory questions related to introducing this new technology and other novel engineering projects." The Fedoruk Centre recently sought proposals for a collaborative, multidisciplinary project to investigate the issues related to the siting of a small nuclear power plant in a previously non-nuclear jurisdiction as a case study. The work will be done primarily by graduate students – including three PhD student and at least 13 master’s students – in areas ranging from geology and geography, to engineering, transportation and law. The project complements the public policy and social engagement research related to energy being undertaken by the Centre for the Study of Science and Innovation Policy at the Johnson-Shoyama Graduate School of Public Policy, which is also supported by the Fedoruk Centre. The study will be performed independent of industry to ensure academic independence. It will be guided by the regulations and standards of the Canadian Nuclear Safety Commission, the International Atomic Energy Agency’s criteria and procedures developed by other jurisdictions. Small modular reactors are a new class of nuclear power plant that are being developed. They have a smaller physical footprint and power output that makes them better suited for smaller electrical grids in concert with renewables, as well as islands and other remote locations where heat produced by the plants can be used for water desalination and heating, in addition to electricity production. Much like airliners, small modular reactors will be built in factories and shipped to where they will be used, rather than being built on site. Innovative designs also take advantage of passive safety systems that can put the reactor in a standby “safe mode” or shutdown altogether without human intervention or external back-up systems. The World Nuclear Association says that more than 45 countries that do not currently use nuclear energy are considering it, including using small modular reactors as an alternative to burning fossil fuels. These countries, as well as jurisdictions in nuclear nations that have not previously used nuclear power, can benefit from the development of a comprehensive approach to the many factors associated with determining the viability of adopting and siting a nuclear power plant - and that’s the kind of information this research team will provide.